Training residents in advanced surgical skills is now possible, and even required, outside of the operating room. However, work-hour limits, increased patient volume, and evolving requirements for objective proficiency mandate efficient and effective training protocols. Virtual reality (VR) surgical simulation may be a useful tool to these ends, but requires thoughtful implementation. We developed and instituted a laparoscopic intracorporeal suturing curriculum on the LapSim 2010 VR simulator platform (Surgical Science, Göteborg, Sweden). Laparoscopic suturing is an essential, advanced skill for all minimally invasive surgeons. Proficiency in laparoscopic suturing, including intracorporeal knot tying, is required for Fundamentals of Laparoscopic Surgery (FLS) certification which must be completed by all surgeons prior to the American Board of Surgery examination. We hypothesize that successful completion of our VR suturing curriculum by novices is an effective tool to help develop laparoscopic intracorporeal knot tying skills. 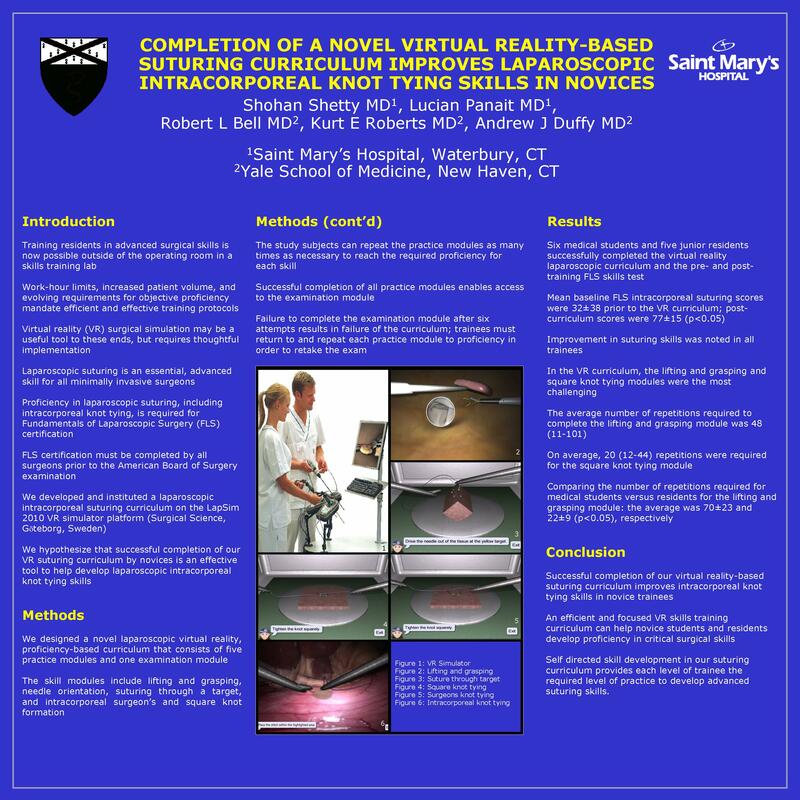 We designed a novel laparoscopic virtual reality, proficiency-based curriculum that consists of five practice modules and one examination module. The skill modules include lifting and grasping, needle orientation, suturing through a target, and intracorporeal surgeon’s and square knot formation. The study subjects can repeat the practice modules as many times as necessary to reach the required proficiency for each skill. Successful completion of all practice modules enables access to the examination module. Failure to complete the examination module after six attempts results in failure of the curriculum; trainees must return to and repeat each practice module to proficiency in order to retake the exam. Our study subjects underwent FLS suturing instruction and baseline testing prior to training exclusively on the VR curriculum. The baseline score is the average of two repetitions of the FLS intracorporeal suturing skill test. The FLS skills test was repeated after successful completion of the VR curriculum and exam. The average baseline FLS scores are compared with average post-training scores and performance data are analyzed for statistical significance with Student’s t-test. Six medical students and five junior residents successfully completed the virtual reality laparoscopic curriculum and the pre- and post-training FLS skills test. Mean baseline FLS intracorporeal suturing scores were 32±38 prior to the VR curriculum; post-curriculum scores were 77±15 (p<0.05). Improvement in suturing skills was noted in all trainees. In the VR curriculum, the lifting and grasping and square knot tying modules were the most challenging. The average number of repetitions required to complete the lifting and grasping module was 48 (11-101). On average, 20 (12-44) repetitions were required for the square knot tying module. Comparing the number of repetitions required for medical students versus residents for the lifting and grasping module: the average was 70±23 and 22±9 (p<0.05), respectively.